Anna Bolton | Greene County News State Rep. Rick Perales presents a proclamation to Greene County Archivist Robin Heise Jan. 25 at Greene County Archives on Ledbetter Road. Greene County Archivist Robin Heise reads a line from registers from the county home, formerly known as the Greene County Infirmary. House Bill 139 will open records like this county home register to the public. In Greene County, this record is already open. XENIA — Greene County Archives is celebrating the passage of House Bill 139, a long-time-coming bill that will lift public access restrictions on records scheduled for permanent retention 75 years after their creation. Governor John Kasich signed the bill into law Jan. 7. It will go into effect Sunday, April 7, opening up records for public access. 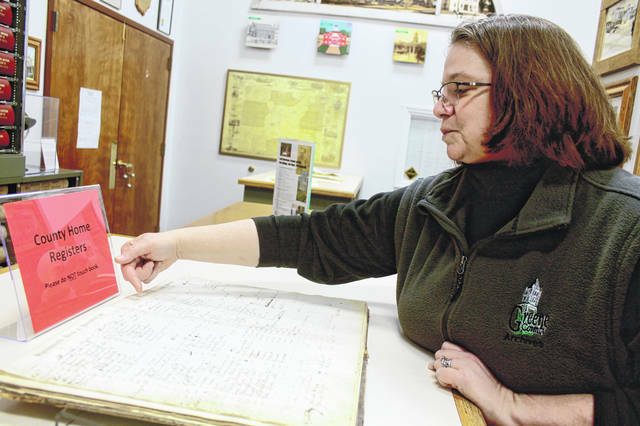 Greene County Archivist Robin Heise said these types of records — which are required to be kept permanently statewide — were previously, in some counties, simply put away on shelves, and couldn’t be shown to the public. Counties have varying laws for the disclosure of permanently retained records. In many of the 88 counties these records were not open before the bill passed; in Greene County, they already were. But Greene County archivists and historians over the years clearly knew how important this accessibility was not just for them, but for everyone in the state. “It’s been a long journey,” said Heise at a celebratory open house Jan. 25, noting that although she’s been involved the last seven years, the effort pre-dates her, going back more than 20 years ago. 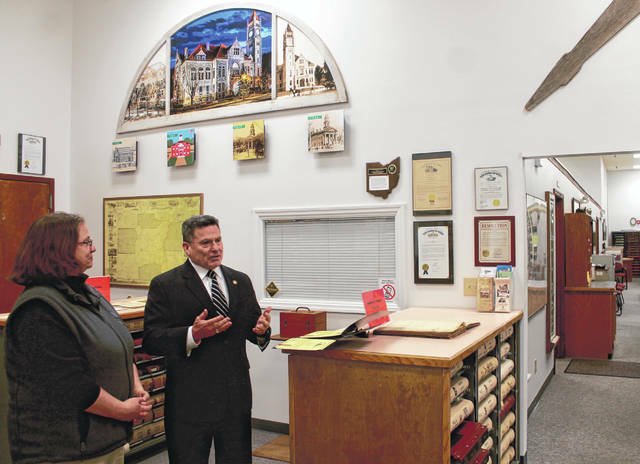 Rep. Rick Perales, a lead sponsor of the bill, visited Greene County Archives to commend the organization on their persistent work toward the passing of the bill. Calling the accomplishment a “tremendous effort,” Perales issued a proclamation to Heise’s staff and one to Dennis Hetzel, president and executive director of Ohio News Media Association, who supported the cause, realizing that the bill would help journalists, too. Heise said they were all involved with testimony during the process. “This was really a grassroots effort,” she said. Other records are subject to local court rulings statewide — like court adoption records and court lunacy records, Heise explained. Current ruling by the Ohio Supreme Court says that it is up to each county judge as to whether or not the records are open in the respective county. 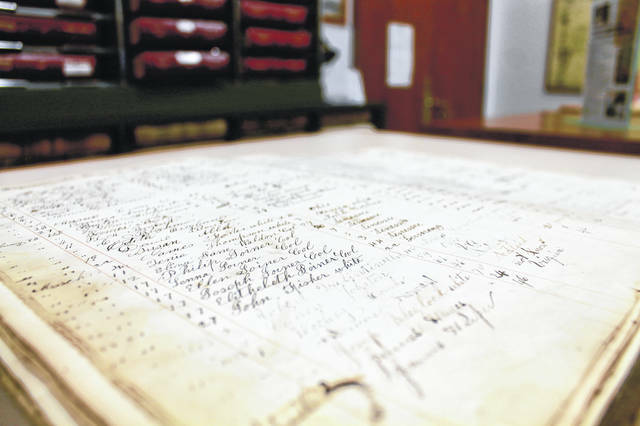 In Greene County, these court records, too, are open 75 years after creation. Heise said she plans to work with the Ohio Supreme Court to open up those records statewide. https://www.xeniagazette.com/wp-content/uploads/sites/32/2019/02/web1_RecordsPerales-2.jpgAnna Bolton | Greene County News State Rep. Rick Perales presents a proclamation to Greene County Archivist Robin Heise Jan. 25 at Greene County Archives on Ledbetter Road. https://www.xeniagazette.com/wp-content/uploads/sites/32/2019/02/web1_RecordsRobin-2.jpgGreene County Archivist Robin Heise reads a line from registers from the county home, formerly known as the Greene County Infirmary. https://www.xeniagazette.com/wp-content/uploads/sites/32/2019/02/web1_Record-2.jpgHouse Bill 139 will open records like this county home register to the public. In Greene County, this record is already open.